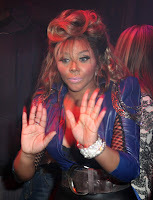 Lil' Kim is just looking scary! That face!!! Sup, it's RoyalKev, love the "you may also like" mentions - great idea! Awoken from a beauty sleep, essay editing service waves fans from a hotel balcony.